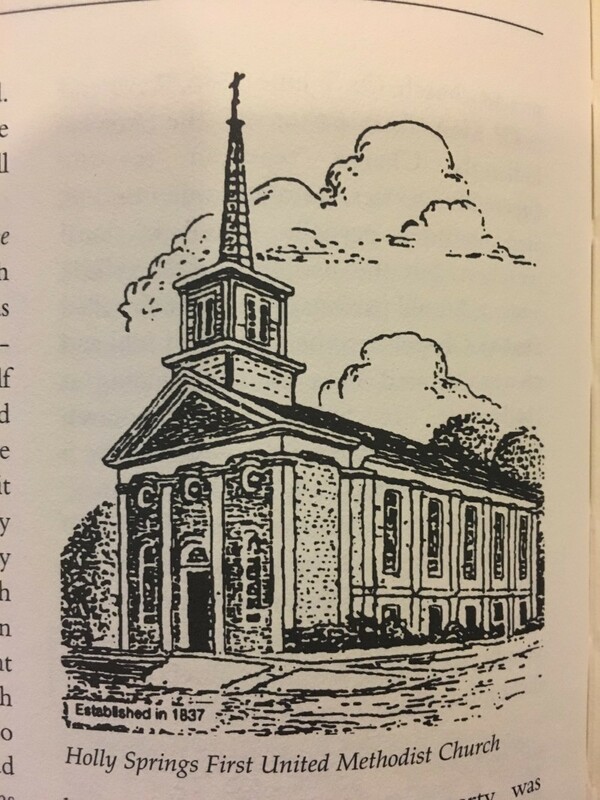 "The Holly Springs United Methodist Church was established in 1837, and the first building was located on the corner of West College and Craft Street. This building later became a residence. The property was deeded to William Long, who built the new church building in 1849 in partial exchange of materials and labor. The deed which records this transfer also shows that the pews and pulpit from this early church were moved to the new church. The lot for the present building was given to the church by Robert Burrell Alexander, one of the earliest settlers of Holly Springs. The front entrance was added in the 1870's. Access before then was gained by a flight of steps to the second floor from the outside. 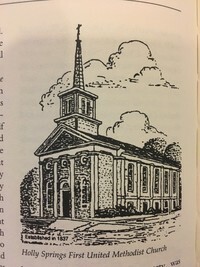 When the church as built, the board decided to rent pews, a practice which was bitterly opposed by Robert B. Alexander, who felt that every person should have a free seat in church. Consequently, after the members rented their pews, he paid the rent on those remaining, stipulating that anyone who so desired could sit in them. After the courthouse was burned during the Civil War, court was held on the lower floor of the church for several years. A Bible, originally the property of the church, was taken back to Deerwood, Minnesota, by Union soldier Daniel Rogers, sometime between 1862 and 1865. It was kept in his family until 1958, when a Rogers' grandson returned it to the church. Federal troops stored gunpowder in the sanctuary and stabled horses downstairs. The pews were pushed together with the seats facing to make feed troughs for the horses. The old parsonage was begun in 1849 and completed in 1862. There are thirteen beautiful memorial windows in the church. The first was placed in honor of a beloved pastor who served from 1888 to 1889, Reverend George S. Inge. The last window was installed in 1954. In 1888 and 1889, the first hand-pumped organ was installed. When Holly Springs United Methodist Church was organized, it was in the Memphis Conference. At a conference meeting in the church in 1868, steps were taken to organize the North Mississippi Conference. This materialized in 1870, so Holly Springs Church claims to be the mother church of the former North Mississippi Conference. Franklin College, later known as Malone College, was opened under the auspices of this church. Three missionaries have gone from the church, Miss Lennie Barcraft, Miss Viola Blackburn, and Doctor Ann Fearn."